John Howe was born in 1913 in Evanston, Illinois. 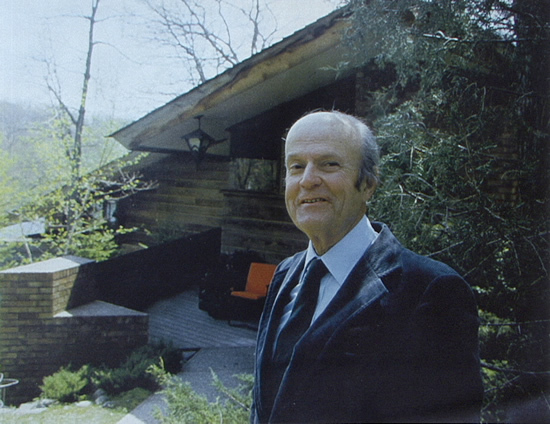 Upon completing high school in 1932, John left to join Frank Lloyd Wright’s forming Taliesin Fellowship, the apprentice program started at the famous architect’s home in Spring Green, Wisconsin. Contrary to legend: that Mr. Wright began calling Howe “Jack” because were already other apprentices named John; there are books and Howe family photos inscribed “Jack” as young as two years old. John become his preferred name once his solo practice was established. By 1937, Howe became chief draftsman amidst the Fallingwater project. He supervised the drafting room for Wright for 27 years until the Master passed away. “My drafting table was his drafting table, always, John comments in interviews.” Many of the perspective drawings attributed to Wright were actually penciled by Jack. In 1947 Jack met Lu Sparks, and the couple was married in 1951. He continued in the same role as a founding member of the successor firm, Taliesin Associated Architects until 1964. During 1964-67, both of the Howe’s worked for Aaron Green, who supervised construction of Marin County Civic Center, the last major commission on the boards when Wright died. In 1967, Howe started his own architecture firm in Minneapolis, Minnesota. The firm completed over 300 projects until it’s closing in 1993. Mr. Howe passed away in 1997.